Efforts on M.177 this quarter have been both challenging and rewarding. In previous columns, you may recall me saying that we were now in a situation where money had become somewhat more important in the current scheme of things rather than getting big turnouts for M.177 work days. This was because of the substantial amount owed to Globe Bearing, the rebuilder of the Winton engine. As a result, a great deal of time was devoted to a fundraising appeal. A quite impressive mailing was put together, and to date it has yielded more than $15,000 in returns. This was obviously a worthwhile use of our time (see Fund Raising Update for more details). Plus, my own energies have been substantially diverted as a result of a nearly year-long effort to locate and buy a home. Much to my relief, I'm now thoroughly settled in and can again concentrate on more important things. One of the things that I did find time to do was to rebuild the massive carburetor assembly for the Winton engine. The carburetor is somewhat unique owing to the vintage and heritage of the engine. The engine was originally designed to burn a fuel commonly referred to as distillate. If that term sounds a little vague, it's because it was basically a waste product of refineries, and consequently the quality varied a great deal from batch to batch. In the 1920s, when the motorcar was conceived, it was felt that an economic advantage could be had by using this fuel which could at times be quite a bit cruder than gasoline. As a result, the carburetor design is massive. Each cylinder head had its own bowl, jet, and throttle valve, for a total of four each. In addition, there was an idle jet and bowl. Santa Fe's experiments with distillate just weren't very successful owing to the increased maintenance problems this crude fuel presented. Burnt valves and cracked cylinder heads were all too common, and by the mid 1930s, the railroad abandoned distillate altogether in favor of gasoline. Distillate by this time was no longer any cheaper than gas, so it was not a hard decision to make. Santa Fe's standard for gasoline at the time was a minimum of 40 octane - remember that premium gas at the time was Phillip's 66, or 66 octane. A redesign of the cylinder heads and the carburetor was therefore in order. The cast-iron "Mooney Quad" heads I have discussed before, but the primary modification to the carburetor involved removing the floats and valves from the fuel bowls and replacing them with weir gates and changing over the fuel line to a recirculating system. This made necessary the installation of an electric fuel pump. Originally the fuel tanks were simply pressurized by the car's air system to 3 psi. Essentially all I have done with the carburetor is take it apart, clean it, and put it back together. Doug Stephens was a big help with this; he took many parts to school to run through the parts washer. Doug was quite careful to label all the parts and hardware, which made reassembly a snap. While he was at it, he also procured some surplus tables from the school for us to use as work tables. While this was going on, Jim Vicars and Kevin Simons serviced and cleaned the batteries. These batteries have been stored outside on a maintenance charge, and later in the quarter Greg Ramsey cut the superfluous lifting lugs off of the battery cases and, with the help of Brian Moore, Greg Gneier, and Dan Price, installed them in the motorcar's battery boxes. This activity was moved up to save the trouble of setting up a designated battery storage area that the city environmental inspector was now insisting on. Another significant achievement this quarter was the reinstallation of the radiators on the roof. Our companion organization ASRA arranged for sandblasting the roof of the UP diner, and this made available a 500-pound manlift. When this lift wasn't in use for blasting and priming, it was used for lifting and placing the radiators. Thanks to Brad Slosar for operating the lift and Greg Ramsey and Greg Gneier for directing and securing. Paint removal on the roof of the car is nearly complete thanks this quarter to the efforts of Ben Coombs, Dan Price, and Jeff Barrow. In the coming months, I hope to be fully occupied with the reinstallation of the Winton engine, so I take this opportunity to invite anyone who is interested to spearhead the completion of the exterior car body paint and installation of the windows. No experience necessary! Just a willingness to follow through to completion. If the idea of getting involved suits you, give me a call at my new number, (626) 794-5275, or come out any Saturday. Hope to see you soon! At this writing we still owe $15,546 to Globe Bearing for rebuilding the M.177's Winton engine. Globe has been very cooperative in arranging a payment plan, but the bottom line is that we need to pay Globe in full before we can have the engine shipped to us for installation in the M.177. Our Fund Raising Drive is still short of its goal, although $10,000 from it has been paid to Globe. What can we do to raise the needed $15,546 in a short time? It has been suggested that we ask our Associates if there are any who would consider cashing in a savings instrument such as a T-bill, providing the proceeds to the Association to fill this short term need, and then taking back a note from the Association for the same principal amount at an interest rate moderately higher than the original instrument, thereby helping the Association fill its short term need and providing a modest profit for the "lender" over his/her original interest. Should any of you be in a position to consider such an arrangement, please phone me at (626) 794-5275 evenings. Thank you. Season's Greetings to All! Lately I've been finishing up work on the Santa Maria Valley number 1000. The biggest problem encountered on the 1000 has been the trailing truck. It is of the Cole type and is of intricate construction including a separate cellar. This doesn't seem to be a problem at first glance except that the cellar is frozen in the journal box casting. Also, this same casting doesn't have any apparent jacking pads. To overcome these obstacles, I have been improvising with a journal jack and clever placement of some tie plates. This solves the jacking problem but I would still like to get that cellar out of the journal box. If anyone has any suggestions, please feel free to stop by and bend my ear - I mean that figuratively, of course! Also, the journal jacks tend to disappear and reappear in different locations in the boxcar from week to week. I'd like to put in my request to everyone who uses these jacks to please put them back in the same place you found them! All that's left to do is inspect the tender journal boxes and then we can start on the last lubrication project: Southern Pacific 3025. I think everyone is looking forward to that project, and I have a lot to tell you about it and its history. In other news, Kevin Simons continued the laborious task of polishing the bell of WP 26. Thanks, Kevin! Highball the tail track? Maybe soon, but not quite yet. Several events in late November may have brought it and the demonstration railroad substantially closer. As mentioned last quarter, I represent the SCSRA on the Recreation and Parks Task Force. 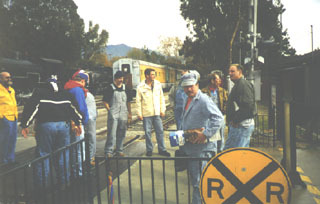 Our first meeting on August 21 was one which defined some terminology as well as allowed the City, SCSRA, and ASRA to express the need and their support for a demonstration railroad, and for the Los Angeles Live Steamers (LALS) to counter with their belief that a railroad would be too expensive, was not needed, and would "fatally displace them." At the second meeting of the Task Force on September 18, attendees walked around Travel Town to see the proposed right-of-way. LALS again turned the focus on the negative impact to them, while Greg Gneier of ASRA and I insisted that with some LALS realignments, the railroad could thread its way through their property without a major negative impact. Unfortunately, on October 4 the LALS Board of Directors unanimously passed a resolution which said in part, "The proposed 'Tail Track' is the start of the 'Demonstration Railroad' route through the LALS Permitted Area. The Board of Directors opposes the entry on the proposed 'Tail Track' into its permitted grounds because it signifies the beginning of the 'Demonstration Railroad' and would begin the systematic destruction of the Live Steamers facility and operations." The rest of the Task Force viewed this resolution as contrary to their very purpose, which is to work through any proposed plans until an agreement is reached. Instead LALS was deciding early to eliminate most of the options from consideration. The City sent a letter advising LALS that they were now in violation of their permit, and this began a series of communications between them. Suffice it to say that input was required from attorneys. On October 15 the Task Force again met and continued discussions on the various route proposals, including one from LALS which would start the railroad on the opposite side of Zoo Drive with only shoo-fly connections to Travel Town proper. LALS also presented alternatives which allowed Travel Town to store equipment while the Train Shed was being built, without affecting their loop area. On November 19, at the Recreation and Parks Board of Commissioners biweekly meeting, LALS was on the agenda to discuss a "progress update" on the Task Force. But instead of reporting on any progress, LALS began by asking to renegotiate their lease. The LALS president who spoke was almost immediately interrupted by the board president, who declared he would not hear any modifications of their lease until the right-of-way issue was settled. President Soboroff flatly stated that the LALS lease could not be used as a roadblock to putting in the railroad, something which will benefit the entire park and the zoo. LALS and presumably the Task Force were given 30 days to come back to the board and say they had reached an agreement. Several SCSRA and ASRA associates were there in the audience, ready to voice their support for the demonstration railroad, but there was no need to speak. Our names were simply read off into the record as supporting the issue. The next day the fourth Task Force meeting took place. Linda pointed out several problems with LALS's alternate plan. Then Greg Gneier, with City and SCSRA support, presented our plans for the loop realignment to accommodate the tail track, and then our new alignment taking the CS&CV RR out of the park at our originally planned location, but then crossing through the picnic area and going around LALS using part of the street and so bypassing the main part of the club's facility. This either requires realignment of the west end trackage to go under the CS&CV right-of-way or complete relocation of the loop to the east. For the first time, LALS cautiously indicated that they might be able to accept one of these alignments. There were still some reservations from other Task Force members, about some geological problems we have to look into and concerns about our ability to safely build the railroad based on the condition of the crossover we are rebuilding and our inability to finish it. The City agreed to have the geologist come out again and review any problems still facing LALS as well as look at the problems that a full-size railroad will have. They will also bring out a surveyor to verify the new grades and determine if it will be possible to actually route the LALS under the CS&CV. We are scheduled to meet again after the surveyor completes his work, around January 8. Folks, if we are going to maintain the momentum we currently have in the Task Force, and get permission to start the tail track, we must mobilize and finish that crossover, preferably by the next meeting in mid-February. There is light at the end of the tunnel (and it's not a headlight!) but only if we start swinging those hammers. If you want to help on this project and don't normally come out, let Gordon Bachlund or myself know. I can be reached at home at (805) 984-0332, work at (805) 982-9720, or via the Internet. Other great news I just heard this week is that the drawings for the Train Shed have come back from plan check with NO red marks! That means we can proceed to pulling permits and going out to bid -- one more reason to hustle on track construction! Max W. Scott (Fredonia, KS) wrote this quarter to thank us for the newsletter copies. He tells us that the Wilson County Historical Museum, located in the old county jail in Fredonia, has just purchased the building from the county. They are busy restoring the building, having replaced the roof, and are in the process of replacing many of the steam pipes. Mr. Scott also enclosed a newspaper article about a 102-mile round trip Onan car (speeder) rally of 30 to 40 cars from Neodesha to Fredonia, Fall River, Beaumont, and back. The group leases the track from the Kansas Eastern Railroad (formerly the Burlington Northern/Santa Fe) on weekends when a minimal number of trains are running. Saturday evening, December 13, associates and their guests, as well as museum staff and friends, enjoyed our annual holiday celebration arranged by ASRA and SCSRA and hosted by the City. 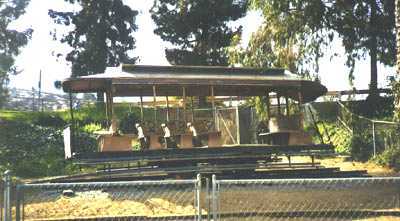 With a 60th birthday theme, festivities began at the Griffith Park Merry-Go-Round (which was installed in 1937) with rides and hot cider, continued in the "Little Nugget" (which made its inaugural run in 1937) with champagne and hot cider, and ended in the Exhibit Hall with a sumptuous buffet dinner and a screening of Disney's Snow White and the Seven Dwarfs (released in 1937). The Disney feature belied its age as it magically transported us into the Technicolor fantasy land of the Princess Snow White, her wicked stepmother, the kind-hearted dwarfs, and Prince Charming! Hot chocolate, coffee, sodas, candy, and freshly made hot buttered popcorn were provided during the show. We are grateful to Linda Barth, Tom Breckner, Patrick Alonso, and the Museum staff for planning and support, to Greg Gneier for organizing the event around the 1937 theme, and to the many who helped make the evening a success. Temporary Equipment Relocations - To accommodate ASRA's plans to sandblast the roof of UP Diner 369, we performed a major switching job on September 13 that placed the Diner on Track 5 east, our traditional sandblasting location, and emptied Track 6 east as all UP passenger equipment found new temporary locations. By a curious twist of switchlist fate, Conrock No. 1, an 0-6-0T switcher, was spotted facing east at the east end of the Connecting Track, a looming live-steam sentinel of impending eastward railroad construction! This major switching activity occurred the same day that many Associates were working in the Diner placing labels on envelopes for our giant M.177 Fund Raising Appeal, and they continued to work even as the Diner itself was moved. If this isn't a first, it ought to be! 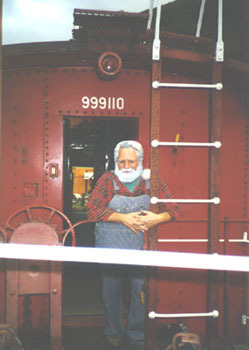 On September 20 AT&SF caboose 999110 (and "Charley") were set out at the platform to be included in the weekend's ASRA passenger car tours, since only the "Rose Bowl" was available in the public area of the Museum, and on September 21 they were placed again in the Restoration Yard. On October 4 another major switching job put everything back where it was, just in time for our scheduled operations on October 5. Final positioning of the UP train set was accomplished after operations. I am grateful to the crew that assisted the writer in switching: Jim Hoffmann, Brian Moore, Jim Vicars, Chris Rippy, Greg Gneier, Tom Graham, Brad Slosar, Ed Sikora, Jeff Barrow, and Dan Price, and to Charles Forsher who documented it all on film. Environmental Wakeup Call! The Restoration Yard was visited by a City environmental inspector during the sandblasting of the UP diner. He expressed concern over the possibility of lead in the paint being removed polluting the sand, and he also looked askance at some of our housekeeping practices. During a follow-on visit, the sand was tested and found to be a minor concern which will require cleanup. Additionally, paint samples were taken from other equipment to determine their paint's lead content. The upshot of all this is the real need for our long-planned RIP (repair in place) track where operations such as sandblasting and painting may be undertaken in an enclosed area with a paved surface to facilitate removal of possibly contaminated debris, and our long-planned covered maintenance area and inspection pit. This places renewed emphasis on construction of the first phase of the CS&CV Railroad, a part of which is the RIP track. However, other items require attention also. Batteries must be stored on special containment pallets that preclude the possibility of electrolyte leakage, and must be covered. Drums containing petroleum products and solvents will have to be stored on similar pallets. Waste materials can no longer be strewn about, but must be properly contained. To get the clean-up ball rolling, we performed an inventory of potential 'haz mat' (hazardous materials) on November 1. A team comprising Brian Moore, Charles Forsher, and the writer spent most of the day culling and counting, and Charles transcribed the field notes into a computer-printed inventory. At the next Quarterly Project Management Meeting this list was given to Linda Barth to be combined with a similar list from ASRA, and plans for the paved maintenance area and inspection pit were discussed. Meanwhile, City environmental forces cleaned up and containerized the potentially contaminated sand and dispatched it to a disposal site. In time we will establish written policies for volunteers who work at the Travel Town Museum. Meanwhile, everyone must pay much more attention to good housekeeping practices. We do not want to deal with offenders in draconian ways, so please keep our premises neat and clean and in conformity with environmental laws and regulations. A Curious Coincidence - Following up on an ad appearing in Progressive Railroading , we sent for information on a new imported 4-wheel diesel-electric switcher being introduced to the US by Electric Transport of America, Inc., in Manhattan Beach, CA. According to the brochure, the unit is powered by a 375HP Mercedes Benz 4-cycle diesel engine driving a 700-volt AC alternator, the output of which is rectified for the two 200-HP, 350-volt DC traction motors. Dynamic braking is provided, as well as air brakes, and is "blended" to work down to 2MPH to save wear on the composition brake shoes. A 24-volt battery is utilized (an interesting departure from normal US railroad practice of 34 or 68 volts), and the design enables the battery to power the traction motors so the locomotive can be moved very short distances on battery power! Physically, it is an offset center cab design, with the long hood housing the diesel engine and the short hood the airbrake and auxiliary equipment. The "comfort cab" is provided with two control stations, so the engineer may face the direction of movement, and utilizes "desk-top" controls like modern US locomotives. Maximum speed is 37MPH and total weight is 48 tons. Having digested this, think about the EMC Model 40 4-wheel diesel-electric switcher we call Charley Atkins, one of only 11 constructed in the early 1940s. Could it be that EMC was a half century ahead of its time? Motor Pool - Chris Rippy was appointed Asst. Mechanical Superintendent of Motor Vehicles on December 16, and he will be responsible for our growing fleet of gas and diesel construction and maintenance vehicles. The fleet grew a bit more with the donation, by Associate Jim Fontenot, of an historic 1967 Kaiser Jeep Corporation 6x6 21/2 ton, ex-military tactical truck equipped with a water tank for fire protection. We will use this vehicle as a water sprinkler truck during railroad construction. Many thanks, Jim, for thinking of the Association! Cabeese - Both SP 4049 and ATSF 999110 have had new ABC-rated 5-pound fire extinguishers installed near each end. Thanks to Tom Graham for installing the brackets. Train crews, please acquaint yourselves with their locations, just in case. The hopper in SP 4049, which leaked past a flapper valve shaft O-ring that was apparently undersized, was removed by Thomas Seal and C�sar S�nchez. During the next quarter the entire pressure chamber assembly will be replaced by one from a hopper salvaged from a scrapped locomotive. Buildings and Equipment - The grounds cleanup continued with the removal of debris left over from the fabrication of the dump truck tail gate, with help from Thomas Seal, C�sar S�nchez, Scott Muir, and Doug Stephens. On Saturday, November 1, while many of us were busy inventorying haz mat, Marc Schirmeister spent the day doing long-needed grounds cleanup. On Saturday, November 15, Charles Forsher cleaned up the signal battery storage area, while Brian Moore, Dan Price, Greg Gneier, Brad Slosar, and the writer began the task of moving crossing protection, signal, and semaphore parts from the east end of the Restoration Yard. The following two Saturdays, with help from Chris Rippy, Brian Moore, Ed Sikora, Dan Price, Steve DeVorkin, Charles Forsher, Kevin Simons, Thomas Seal, Jon Hathaway, and Doug Stephens, the remainder of these parts and other parts stored elsewhere were moved to their designated areas, affording a clear area in which to stake the location of the new concrete pad for our long-planned maintenance area. 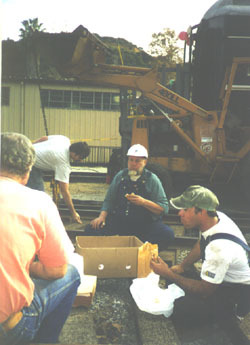 When the horsecar was relocated, the dual (561/2" and 42") gauge track panel upon which it resided for so long was moved to the Restoration Yard. Tom Graham, with help from Joe Barilari, reassembled it onto new steel channel "ties" and re-gauged it (561/2" and 36") so that the Carter Bros. arch-bar trucks from the fallen SP narrow-gauge gondola car might have a safe place to repose. Thanks, Tom! M/W News To accommodate the New Entrance Project, the historic standard-gauge horsecar adjacent to Track 5 West needed to be moved. The Rio Vista waiting shelter at the southwest corner of the grounds between the 16-inch-gauge train tracks and Zoo Drive seemed a good place. Accordingly, a temporary 3-foot-gauge track panel, set there some years ago to display the trucks from a defunct narrow-gauge SP gondola car, was disassembled, the site was graded, and a new standard-gauge track panel was installed for the horsecar. We are grateful to Ed Sikora who led the work and to Brian Moore, Charles Forsher, Jeff Barrow, Dan Price, C�sar S�nchez, Doug Stephens and Thomas Seal. This was C�sar's first experience with M/W work, and he handled the spike maul like a pro! The car was moved on October 22 by the Dept. of Water and Power, and now the Museum's master carpenter, Tony Comundoiwilla, will begin cosmetic repairs to the car body and the waiting shelter. The equipment relocation switching work of September 13 and October 4 was accomplished with the Tracks 6 to 7 Crossover out of service due to incomplete work. The added switching effort thereby required pointed out most eloquently the need to complete the Crossover project as soon as possible, let alone install the long-stored rubber grade crossing material in Tracks 5, 6, and 7 at the pedestrian crossing. Accordingly, it was decided to include the Crossover in our ambitious plans for a Volunteers United Marathon Work Day on October 11, the day of our OktoberFiesta. Under the leadership of Ed Sikora and Jeff Pippenger, a team comprising C�sar S�nchez, Steve DeVorkin, Bob Bennett, Jesse Navarro, Brad Slosar, Dan Price, and Jeff Barrow labored on the crossover project, spiking and lining 75 feet of tangent track. On subsequent weekends, Joe Barilari and Jeff Pippenger selected and transported appropriate switch ties to the work site, and Joe and Tom Graham placed the ties. Based on our earlier success, we decided to schedule another Marathon Workday, this one on December 13, the day of our Volunteers' Holiday Party, to keep the progress going, and Dan Price coordinated and telephoned volunteers. Under the leadership of Joe Barilari, a team comprising Ed Sikora, Brian Moore, Chris Rippy, C�sar S�nchez, Dan Price, Mike Flaherty, Jeff Barrow, Steve DeVorkin, Jeff Pippenger, and Charles Forsher placed the frog, the switchstand, and the points, and continued re-placing and spiking rail. Our Gang assembled again on December 20 and made further significant progress. 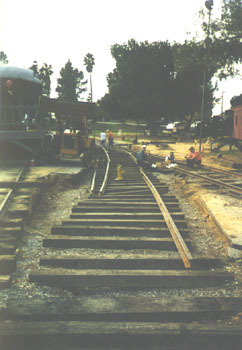 The west switch of the crossover was assembled, all remaining rail to complete Track 7 was placed and much of it spiked, and the task of leveling and lining was begun. So fast was the pace of the work that we literally ran out of ballast, but Linda arranged an additional shipment which arrived prior to December 27. To finish the year with a bang, Our Gang worked on December 27, and special thanks are due to Joe and his post-Christmas crew which included Ed Sikora, Brian Moore, Charles Forsher, and C�sar S�nchez. As may be seen, Our Gang is "on a roll," and invites your participation. For information, e-mail Joe Barilari or call him at (626) 303-1169, or e-mail Dan Price or call him at (818) 241-5904. HALLOWEEN HAUNTED HOUSE A HOWLING SUCCESS! On Saturday, October 25, the 'Train Club' volunteers hosted our Third Annual Haunted House event in the M.177, the proceeds of which were donated to the M.177 Fund. Thomas Seal, Scott Muir, Nick Mecca, C�sar S�nchez, Adam Seal and friends, or was it fiends, provided the decor, ambiance, ghosts and hauntings, and conducted visitors through the haunted railcar where they encountered eerie sights such as the "ghost engineer" and other frightening apparitions, sensed the presence of otherworldly beings and things that went "bump" in the night, all enhanced by special fog and lighting effects. Following this harrowing experience, visitors enjoyed light refreshments and no-host sodas and beer in the warm and exorcised interior of SP caboose 4049. It was a fun evening, and if you missed it be sure to look for the Fourth Annual Haunting next year. Thanks, Train Club and fiends! We were saddened to learn of the demise of one of the Association's most valuable volunteers, Someone Else. Someone's passing created a void that will be difficult to fill. Someone had been with us many years, and did far more than the normal person's share of the work. Whenever leadership was mentioned, this wonderful person was looked to for inspiration as well as results. Wherever there was a job to do, a committee to chair or a meeting to attend, one name topped everyone's list: "Let Someone Else do it." Someone was a wonderful person, sometimes appearing superhuman, but one person can only do so much. Were the truth known, everyone expected too much of Someone Else. Now, Someone Else is gone. We wonder what we are going to do. Someone Else left a wonderful example to follow, but who is going to follow it? Who is going to do the things that Someone Else did? When you have an opportunity to participate, please remember, we can't depend on Someone Else any more! Southern California Scenic Railway Assn., Inc. The old post office box in Glendale will be retained for the time being to allow ample time to transition to the new box address. We will advise when the Glendale address is no longer valid. We also have a new e-mail address. E-mail sent to this address is received by several officers of the organization. From there it is answered or forwarded as needed. That e-dress is SCSRA Dispatcher. Charley Atkins' fire protection has been enhanced with two new 20-pound ABC-rated fire extinguishers, replacing the original CO2 units. Their size may suggest "overkill," but we felt an obligation to replace the old 15-pound CO2 units more or less in kind for aesthetic reasons. Charely also received her semi-annual oil and filter change. She doesn't put in a lot of miles, but she does spend a lot of her days idling, which can be even worse for a small diesel. The CWR 56 has also been fitted with a new five-pound ABC-rated first extinguisher. Moreover, she was the recipient of some "under the hood" attention as Chris Rippy and Brian Moore removed the shutter assembly in front of the radiator fan, and cleaned and inspected the fan shaft front bearing. This is in preparation for the complete removal of the radiator fan and shaft for machining. It is too early to tell if the front bearing will require replacement like the rear bearing. Both locos received additional doses of a fuel additive to retard bacterial growth and precipitate water and particulate matter, and of jacket water corrosion inhibitor, and Charley received a lube oil and filter change. Staffing the Diesel Shop this quarter, in addition to the above, included Gordon Bachlund, Alan Weeks, and Gregory Ramsey II. Saturday, October 11, provided perfect weather for our annual Oktober Fiesta. This year we decided to schedule an all-hands SCSRA/ASRA "Volunteers United Marathon Work Day" for the same Saturday. As a result, progress was made on the Track 6 to 7 Crossover Project by the M/W gang and their friends, and a special track panel for display of the horsecar was completed with a llow retaining wall and drainage provisions. After the work session, the handcar was brought out for everyone's enjoyment, and delicious beef, pork, chicken, and sweet tamales were served, along with no-host sodas and Mexican beer. The event attracted 20 volunteers during the day, and an additional 30 participants in the evening. As Greg Gneier, ASRA's president, observed, "It was a smashing success!" In addition, the appeal gained us 18 new Regular Associates, 4 new Supporting Associates, 3 new Patron Associates, 1 new Life Associate, and 4 Regular Associate renewals, totaling $1,425 in Associate membership fees. Thank you, new and renewed Associates! Finally, a very good friend of the Association, Mr. Harold H. Thrasher, who served for a time as brakeman on the Clinton, Oklahoma, to Pampa, Texas, run of the M.177 in 1952-1953, ultimately retiring as the highest seniority conductor on the Plains Division, and who has provided invaluable historical information over the past five years through correspondence and taped interviews, sent a special donation in honor of Chell Hurdle. Thanks, Mr. Thrasher! In grateful appreciation for your many kindnesses to the Association, the Board voted you to the status of honorary life membership at its December meeting. "Tickets, please!" As mentioned in my last report, we inaugurated a new souvenir ticketing program concurrent with the special operations held for the Griffith Park Resources Board. This quarter saw the first regular operations using the new tickets. The whole thing was started by Greg Gneier and Gordon Bachlund, who developed a tentative design. Enter Ed Sikora, who had also been designing a transit-like ticket. The three got together and developed a final design, which was executed by Greg. Linda Barth got the printing done by the City and Ed has been numbering them consecutively on an as-needed basis. My thanks to the above for a fine professional job. Meanwhile, Dan Price and Jeff Barrow have been busy generating lots of "chad" (ticket punching residue) and selling them (the tickets, that is) to the public. Our policy is that each person who donates $1 or more receives a ticket. That this operation is a success is shown graphically in the quantum leap in donations from less than 50� to almost $1 per passenger! Hearing a (very) few grumbles from the public about the "supposed free rides," we began emphasizing that a ticket is not required to ride the train. This caused the October numbers to taper off slightly to a still-impressive 65� average. Speaking of punches, Dan has taken on the responsibility to register all Associates' punches. Punches used on railroads and transit companies make distinctive hole patterns. Each employee's punch pattern is registered and serves as a "signature" when punching tickets, transfers, and the like. If you own a punch, bring it by sometime and let Dan register it. Dan is also ordering punches for Associates from Transquip. If every Associate's punch is registered with him, he will know which patterns not to order. Thanks, Dan! Our public operations were held September 7, October 5, November 2, and December 7. The weather stayed hot through November, and then El Ni�o hit with a vengeance! Our December operation featuring Santa Fe Claus was virtually wiped out by a monster storm which hit the Southland the day before. While our operations were relatively unaffected by the wetness (other than slippery rails), attendance was severely down. There was one birthday party in the park which provided the bulk of our afternoon business. 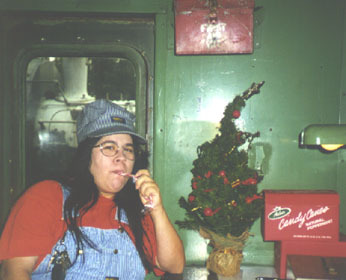 Still, sitting around in a nice warm and dry caboose sure beats doing a lot of other things! And now for the honor roll featuring those who braved the crazy weather to keep our passengers happy. Those with recorded times included Gordon Bachlund, Jeff Barrow, Bob Bennett, Dale Brown, Robert, John, and Margaret Daum, Steve (SFC) DeVorkin, Mike Flaharty, Charles Forsher, Tom Graham, Brian Moore, Dan Price, Jerry Price, Greg and Yvonne Ramsey, Chris Rippy, Ed Sikora, Doug Stephens, Jim Vicars, and Alan Weeks.